This is yet another recipe I’ve had in my to-blog file for quite awhile. Thankfully unlike some recipes I didn’t make it last year and promptly forget it. I can think of at least three recipes I’ve done that with. When I had originally thought of this recipe I had planned on making homemade ravioli. That didn’t happen, this time at any rate. 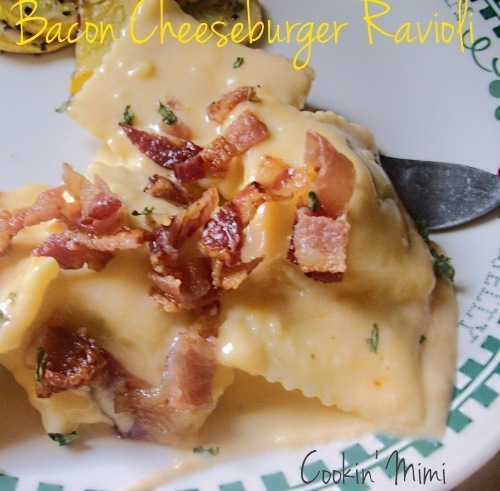 I used frozen beef filled ravioli and make a cheddar sauce and topped the cheesy, beefy goodness with crumbled crispy bacon to make it even better. Melt the butter in a medium sauce pan. Whisk in flour and cook for 2 minutes. Whisk the milk and salt into the butter and flour a bit at a time. Bring to a bubble and cook for 5 minutes or until thickened. Remove from heat. Stir in the cheese about 1/2 cup at a time until melted. Pour cheese sauce over cooked and drained ravioli, stirring well to coat. Sprinkle individual servings with bacon. Hi, this sounds really interesting and I bet tastes great! I saw it on table for seven link party. What a fun idea! Sounds so delicious, already pinned. 🙂 Thank you for sharing at #GetHimFed Fridays, would love to see you again tomorrow!